bold powerful communication for any application or market. We provide an integrated solution allowing clients to drive results with the help of a single source. Our 360 degree focus targets our clients' core needs and drives long-lasting relationships. We have invested in some of the best equipment and color management processes so we can create consistently stunning visuals for our clients. And, our team has a laser focus on maintaining the highest levels of quality for everything that leaves our doors. Our production process is built around being able to say yes when others say no. 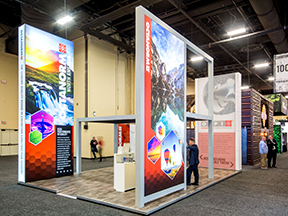 Industry leading production times plus large inventories of media displays and accessories gets you what you need in no time. We are constantly driving down production costs to maintain affordability and ensure you can stay on budget. Our scale creates production efficiencies which directly benefit our customers' bottom lines. Most projects we tackle include custom graphics, but what if you need something out of the box that no one else is doing? Our product development team can conceptualize new ideas, source components and manufacture an integrated solution to hit your unique goals. We are passionate about our clients. We know you have choices when it comes to finding a solutions provider, and our first-rate client services team will do anything possible to make sure your experience working with us is unbeatable from start to finish. Companies across the globe trust Xarisma to help expand their brand and reach their customers. We've been privileged to work with some of the finest brands in the world.